LAGOS, Portugal (AP) — In a story Feb. 6 about a museum exploring a Portuguese town's role in the African slave trade, The Associated Press misidentified the museum's Portuguese name. It is O Mercado de Escravos, not El Mercado de Escravos. Removes reference to conquistadors. DETROIT (AP) — Detroit has made Fodor's Travel Go List of 52 recommended destinations to visit next year. It joins such locales as Bears Ears National Monument in Utah; Puerto Rico; Lagos, Nigeria; Berlin; and Morocco's Atlantic coast. The popular international travel guide says "Detroit has had several false starts, but it looks like America's favorite comeback city is finally making a legit comeback." LAGOS, Nigeria (AP) — The woman who led the global campaign to free Nigerian schoolgirls kidnapped by Boko Haram extremists is now running for president, saying she is fighting for "the soul" of Africa's most populous nation. Oby Ezekwesili is the most prominent woman to seek the presidency in Nigeria, where politics, as in many African nations, have long been dominated by men. BERLIN (AP) — A Swiss shipping company says that a bulk carrier has been attacked by pirates off Nigeria's coast and 12 of its 19 crew members have been kidnapped. BLUEFIELD, W.Va. (AP) — Officials say a basketball player at a West Virginia college who died had just finished a pickup game when he collapsed. Bluefield State College Athletic Director John Lewis tells news outlets that 24-year-old Timeyin Amatosero-Keke (tih-MAYN' ah-mah-toe-SEHR'-oh-KE'-KE') died Monday night. Lewis says an athletic trainer told him Amatosero-Keke, of Lagos, Nigeria, was packing up to leave a pickup game session at a high school when he collapsed. LAGOS, Nigeria (AP) — French President Emmanuel Macron shook up his two-day visit to Nigeria with a stop at the New Afrika Shrine, a concert hall founded by the late music legend Fela Kuti where partying Nigerians gather, though the usual gyrating dancers and marijuana were absent. LAGOS, Nigeria (AP) — Nigerian officials say nine people are dead after an oil-carrying tanker truck crashed and burst into flames on a bridge in Lagos. The Lagos state emergency management agency says in a statement that one of the dead was a child. Another four people were injured in the accident Thursday evening, and 54 vehicles were burned. JOHANNESBURG (AP) — The Confederation of African Football says Nigerian referee Joseph Ogabor has been banned for one year for "attempted match manipulation" during an international club match earlier this month. The decision follows investigations conducted and evidence submitted by the South African match officials who were in charge of a Confederation Cup game in Lagos on April 7 between Nigerian team Plateau United and Algerian club USM Alger. Plateau United won it 2-1. LAGOS, Nigeria (AP) — After more than a year in office, President Donald Trump for the first time is hosting an African president at the White House. The meeting with Nigerian President Muhammadu Buhari on Monday comes after an uncomfortable start to the Trump administration's approach to the world's second most populous continent. In her second novel, Welcome to Lagos, young Nigerian writer Chibundu Onuzo returns to some of the themes that drove the twists and turns of her award-winning first novel, The Spider Kings Daughter. Lives as varied as they are storied find themselves together in Lagos, the overpopulated Nigerian city with the aimless energy of a crowd, static electricity flowing nowhere, sparks rising from too many bodies jostling in too little space. JOHANNESBURG (AP) — Four South African match officials were offered $30,000 to fix an international club game in Nigeria this weekend, their country's national soccer association said Thursday. LAGOS, Nigeria (AP) — Police in Nigeria say they have arrested the Danish husband of a popular local musician who was killed along with their 4-year-old daughter in Lagos. Police spokesman Chike Godwin Oti tells The Associated Press that 29-year-old Zainab Nielsen, popularly known as Alizee, was killed Thursday with her daughter in their apartment on upscale Banana Island. He says there were marks of violence on the bodies and the homicide unit is investigating. ATLANTA (AP) — Delta Airlines says an engine issued forced a flight from Nigeria to Atlanta to turn back and make an emergency landing at the airport it departed from. LAGOS, Nigeria (AP) — The head of the U.S. Consulate in Nigeria's capital says U.S. support for Nigeria's economy will continue given the African country's demographics. United States Consul General F. John Bray spoke with The Associated Press on Monday after participating in the closing gong ceremony at the Nigeria Stock Exchange House in Lagos. ATHENS, Ga. (AP) — "I choose to be happy; I choose to feel blessed. I know that I am favored by God, and I am nothing less." The lyrics above come from the first lines of a song written by 22-year-old Maria Anifowose and are just one indicator of the native Nigerian's determination, graciousness and positive attitude. WARRI, Nigeria (AP) — A Nigerian military official says four abducted Chinese nationals have been rescued after a gun battle with sea pirates. Army spokesman Maj. Ojo Adelegan says the four expatriates were kidnapped Friday while travelling from Lagos to Ondo state in the south. He says the military received a distress call and captured one of the kidnappers. He says some of the Chinese nationals were wounded and all are receiving treatment. LAGOS, Nigeria (AP) — Some knelt and placed their foreheads to the ground in prayer. Several carried small children. After being stranded in Libya on a failed attempt to reach Europe, more than 400 Nigerian migrants were brought home and began sharing stories of abuse and fear. LAGOS, Nigeria (AP) — The trials of more than 1,600 suspected Boko Haram members have begun behind closed doors at a military barracks in northern Nigeria, the largest mass trial in the Islamic extremist group's history. Nigeria's government is trying to show it is making progress against the group that has killed more than 20,000 people during its eight-year insurgency, but lawyers and rights groups are expressing concern about whether the suspects will have fair trials. "Nigeria is a party nation," says Lanre Akinlagun. "Any wedding, funeral or graduation is an opportunity to party here." Parties are Akinlagun's business, and business is good. The British-educated entrepreneur is the director of Nigeria's largest online alcohol retailer Drinks.ng, which has not merely survived but thrived during a prolonged recession. Sales have increased by around 80 percent in each of the last two years, says Akinlagun, and the roster of clients has grown rapidly. LAGOS, Nigeria (AP) — A four-story residential building collapsed in Nigeria's largest city and killed at least eight people, including a child, emergency officials and an Associated Press photographer in Lagos said Wednesday. Authorities said at least 15 people had been rescued from the rubble of the building that collapsed Tuesday afternoon. 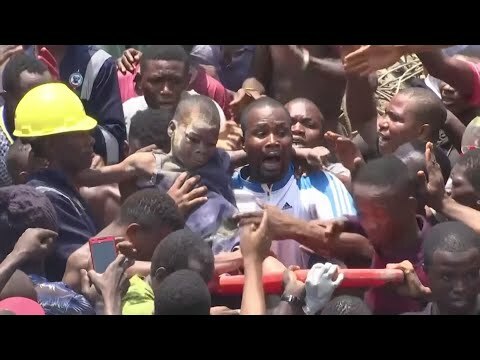 Officials say rescue efforts have ended at the scene where a four-story residential building collapsed and killed at least eight people in Nigeria's largest city. Kehinde Adebayo with the Lagos State Emergency Management Agency said Wednesday afternoon that rescuers are giving way to investigators who will seek the cause of the collapse. LAGOS, Nigeria (AP) — The United States government is teaming up with Nigerian groups to launch a web-based platform allowing people to report everyday corruption in Africa's populous nation. Graft is widespread and sometimes spectacular in Nigeria, and President Muhammadu Buhari took office in 2015 vowing to eradicate it. He warned that "if we don't kill corruption, corruption will kill Nigeria." LAGOS, Nigeria (AP) — Few people think it's funny that Nigeria's president is on extended medical leave in London for the second time this year. But Mike Asukwo sharpens his pencil as he plans his next political cartoon. GADSDEN, Ala. (AP) — An Immigration and Customs Enforcement detainee has been charged in connection to a fire inside the Etowah County Detention Center. Etowah County Lt. Robin Grant tells local media that 22-year-old Okiemute Omatie of Lagos, Nigeria, is charged with one count of first-degree arson and one count of destruction of state property in connection with the May 26 fire. LAGOS, Nigeria (AP) — Nigeria, West Africa's economic and military powerhouse, is adrift as President Muhammadu Buhari has been in London for medical treatment for a month as of Wednesday, worrying many that his undisclosed health problems have left Africa's most populous country without strong direction. WARRI, Nigeria (AP) — Nigeria's federal high court has ordered the forfeiture of more than $43 million to the federal government after the money was found in a Lagos apartment and no one sufficiently proved it was theirs. Justice Muslim Hassan ruled Tuesday that the cash was suspected to be proceeds from unlawful activities. Nigeria's Economic and Financial Crimes Commission found the money when it acted on a tip and raided the apartment in April. LAGOS, Nigeria (AP) — Authorities say hundreds of Nigerians deported from Libya have arrived back home, including one who sustained a gunshot wound. The deputy director of the National Emergency Management Agency, Bandele Onimode, says some of the 258 returnees are suffering from depression and malnutrition. Four children and an infant were among the group that arrived in Lagos late Thursday. WARRI, Nigeria (AP) — Authorities say at least 26 people have died after two buses collided and caught fire on a busy highway in western Nigeria. Oyo state police spokesman Adekunle Ajisebutu said Saturday that 11 others were injured in the crash. Police said the two buses were trying to overtake other vehicles on the Lagos-Ibadan Expressway and ended up striking each other. ABUJA, Nigeria (AP) — Nigeria's president on Wednesday suspended the country's intelligence chief over the recent discovery of $43 million in cash in a Lagos apartment. BERLIN (AP) — Germany has deported an alleged Islamic extremist deemed dangerous by authorities to Nigeria. The dpa news agency reports that the 22-year-old man, who was born in Germany and who hadn't committed a crime, arrived in Lagos Thursday. The unnamed man was one of two detained in February in Goettingen during an investigation of suspected attack plans. JOHANNESBURG (AP) — Thousands of people were fleeing a Nigeria slum as security forces used gunfire and tear gas to make way for demolitions in defiance of a recent court order, rights groups said Friday. The operation was unfolding in Lagos, the sprawling commercial hub of one of Africa's largest economies, Amnesty International and Slum Dwellers International said. DUBAI, United Arab Emirates (AP) — The pilots of a Nigerian airliner failed to follow emergency procedures and didn't land after one of the plane's two engines lost power only minutes into the flight, according to a government investigation into the June 2012 crash that killed 153 on board and others on the ground. TALLAHASSEE, Fla. (AP) — Florida State's most popular player isn't one of the Seminoles leading scorers. That honor belongs to workmanlike senior center Michael Ojo. The 7-foot-1 Ojo's improved contributions on the court have helped the 15th-ranked Seminoles assure themselves a berth in the NCAA Tournament for the first time in five years. When Ezekiel Balogun was 14 years old, he got on a plane by himself in Lagos, Nigeria, for a 13-hour flight from Africa to America. What awaited him in the U.S., Balogun hoped, was a chance at a better life. "It was because of the opportunities that America provides," said Balogun, now 19 and a freshman on The Citadel's basketball team. "Back home, if I had just gone to school, getting a job would have been much more difficult. My dreams of playing basketball would be dead for me. LAGOS, Nigeria (AP) — Hundreds of Nigerians marched Monday to protest poverty and corruption as President Muhammadu Buhari's prolonged absence abroad for medical tests raises political and economic tensions. "Nigerians are frustrated and tired with this absentee government," activist Omoyele Sowore said as he marched in Lagos, Nigeria's largest city. Protesters carried placards saying: "Unemployed people hungry and angry." LAGOS, Nigeria (AP) — The governor of Nigeria's most populous state has signed a law authorizing the death penalty for anyone convicted in a kidnapping where the victim dies. Lagos state Gov. Akinwunmi Abode says the law he signed Wednesday will help halt a spate of kidnappings for ransom. Victims have included schoolchildren, officials and foreign workers. When European explorers discovered the Yoruba kingdoms in West Africa in the 15th century, they found a civilization already established over 500 years earlier. The culture spread across the world, partly as a result of the slave trade, with its vibrant artistic traditions, albeit fading, still felt as far as Cuba, Haiti and Brazil. Now, designers are reinventing ancient Yoruba crafts for their modern creations. LAGOS, Nigeria (AP) — Nigeria has demanded that Taiwan relocate its trade office following a visit by China's foreign minister and a promise of $40 billion in investment. Taiwan quickly protested, calling China's actions "crude." During a visit by Chinese Foreign Minister Wang Yi on Wednesday, Nigeria publicly reiterated its support for Beijing's "One China" policy, which considers the self-governing island part of its territory. Nigeria added that its stance does not preclude trade with Taiwan.